Warriors For Justice Blog Crash versus Accident: What is the Difference? Crash versus Accident: Do Words Matter? The language we use helps shape our perceptions. If our word choice downplays an issue, we might not take that issue as seriously as we should. This is what many advocates say is happening with the common use of “accident” when describing any type of collision involving one or more vehicles. The basic idea is that the word “accident” implies nobody is at fault. The phrase “accidents happen” is a common way to say that the unfortunate event just… happened. The attitude that accidents will just occur no matter how we drive might actually lead to an increase in automobile-related injuries and fatalities. Proponents argue the word “accident” significantly downplays personal responsibility when driving. Roughly 90% of all vehicle accident are the result of human error. Only about 10% of accidents are caused by vehicle error, weather or another non-human-related event. The word accident can mean a human-caused collision. But it can also mean a wreck due to a tire blowout, unexpected flash flood or another instance where the driver is truly not at fault. Who Supports Replacing the Word “Accident” with the Word “Crash”? Safety advocates, grass-roots groups and even state and federal officials have all shown support for the word change. In 2016, Nevada passed a state law changing “accident” to “crash” in dozens of official government documents such as police and insurance reports. Additionally, at least 28 other state departments of transportation no longer use the term “accident” in relation to vehicle-based incidents. He explains his reasoning on the front page of his site. It’s not an ‘accident’ when a person makes a decision to drive drunk, distracted, or in a negligent manner. Larason’s main goal is to increase awareness among major media outlets. He wants them to stop using the term accident in news reports. Some media outlets have made changes. The Associated Press now uses the word crash when negligence is claimed or proven in a crash. Other major outlets like the New York Times haven’t taken an official position on the terms. While everybody wants to prevent car collisions, not all safety groups agree with the word change strategy. Critics say the word “accident” is more familiar to people. Generations of people have learned to drive when the word accident was commonly used to describe fatal and serious car collisions. For instance, the Virginia Department of Transportation determined their drivers generally felt more comfortable and familiar with the term “accident” – so they’ve decided to keep using the word in their official documentation. 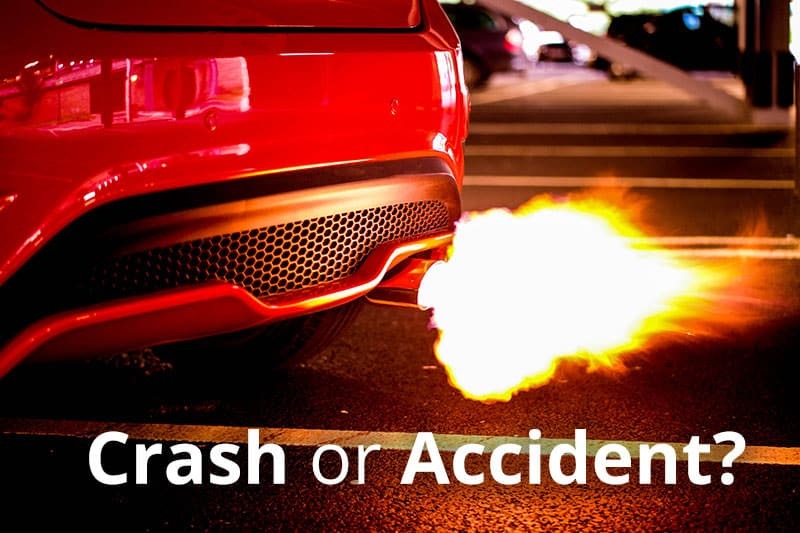 One of the most common criticisms is that the word “crash” is simply too confusing. On a scale where one side is a minor fender bender accident and the other is a serious accident, where does a “crash” fall? The terms “minor accident” and “major accident” are commonly used in both the media and public discourse. But what is considered a minor accident and what’s considered major? Generally, people consider minor accidents to be ones where not much damage is caused to the car and all the people involved in the accident are basically free from injuries. Minor accidents have no fatalities. Major accidents are much more severe. They usually involve loss of life or at least serious injuries. Serious car accident injuries can be permanent or very long-lasting. Plus, vehicles that have been in a major accident will be damaged significantly if not outright totaled. While these terms are common, they’re not official. Car insurance companies, police departments or government agencies generally don’t categorize accidents based on those terms. One exception is during severe weather such as a snow or rain storm. Many cities will declare “accident alerts” where drivers are advised to only call the cops if a major accident occurs. Unless there are injuries or vehicle damage, all parties are supposed to exchange insurance information and then clear the roads. Is There Such a Thing as a Minor Accident? The term “minor accident” is a little misleading. Just because passengers walk away and the vehicles aren’t damaged doesn’t mean all is well. Many seemingly small accidents can cause serious personal injuries later on such as neck pain, headaches and other long-term issues. Whether minor or major, the word accident has an interesting history. The definition of the word “accident” probably doesn’t apply to every car crash. Of course, language changes over time. The word accident can have a secondary meaning, similar to how the word literal has two common uses with opposite meanings. So, how did the word originally start to have a change in meaning? Back in the 1900’s, manufacturing jobs were pretty dangerous. When workers were injured on the job, employers were responsible for their medical care. Although perhaps not the most moral choice, most employers didn’t want this financial responsibility. The concept of workplace “accidents” was created to excuse the employer of any financial responsibility for worker injuries. After all, the word “accident” in the 1900s only had one definition. An accident was an unexpected occurrence which was not the result of anyone’s misconduct. But the phrase was applied in a tricky way. The implied cause of the accident wasn’t the worker – it was the company. Many early manufacturing injuries were often the result of improperly maintained machines, long shifts and other unsafe working conditions. By blaming accidents, employers were basically saying that any workplace injuries were simply just something which…. happened. To further drive the point home, industrialists and other business owners began to promote a cartoon character named Otto Nobetter. Otto was quite the careless worker. His negligence in various tasks in the workplace frequently left him hurt, flattened, burned or even blown up! On the surface, Otto seemed designed to keep workers safe. He pointed out the do’s and don’ts of working around electricity, water, combustible materials and other potential hazards. If a worker follows all the safety procedures, the cartoon implied, he or she won’t get hurt. But the Otto cartoons conveyed a second message, too. The workplace itself was always perfectly safe. As long as all the workers followed the rules, the work day would be free from injury. Of course, in many instances, the workplace itself was the biggest problem. Many early worker safety campaigns implied that the only way an injury could occur was due to worker negligence, sloppiness or inattention. Soon the recently-invented automobile began to sweep across the country. Unfortunately, this new invention didn’t integrate into American life very smoothly. Traffic deaths were practically an epidemic in the 1920s. Automobile manufacturers knew their industry was in a crucial stage. If people thought that cars were dangerous, this new industry would be stopped before it really had a chance to get started. Instead, automobile makers needed to convince the public that these roadside fatalities were the result of driver error and not the fault of the cars themselves. Auto manufacturers and insurers took a page from early industry. They began a campaign to promote the idea of auto “accidents” where the event was simply out of anyone’s control. Even though they initially wanted the term to imply reckless driving, that’s not really the case in modern times. Modern cars don’t have nearly the number of safety issues as their predecessors. The auto industry doesn’t have to hide behind the word “accident” to convince people cars are generally safe. However, the term has no become so commonplace that the role of the driver has become incredibly minimized whenever there’s a crash. Now “an auto accident” is often thought in terms similar to a lightning strike or any other event which occurs beyond anyone’s control. A “Serious Accident” or a “Fatal Crash”? So, which term is best? It’s important to remember that all auto safety groups want to end fatalities on the road. In some cases, the word “crash” might help people think of driver safety in a whole new way. In other cases, the existing term “accident” provides clarity and familiarity which isn’t worth changing. The debate between “crash” and “accident” can only raise awareness of driver responsibility when behind the wheel – and that’s a goal everyone can agree on! If you have been injured in a car accident/crash or have any questions, the lawyers at Hutchison & Stoy are here to help. Contact our law firm or fill out the free case evaluation form to speak to someone immediately.